Jeff Baldwin knew he didn't have much natural speed, he told The Orlando Sentinel in 1987. To get around that, he told The Sentinel, he just had to play harder. ''Pressure? I don't put any on myself," Baldwin told The Sentinel that May. "I give 100 percent, play hard every day. I thrive on pressure situations because that's when it counts the most and when people stand up and take notice. Anybody that doesn't like those situations shouldn't be playing the game." Baldwin was playing games in his third professional season that year, trying to make sure people took notice. Eventually, people would take notice, and Baldwin would play in the major leagues. The chance for people to notice him there, though, was brief. Baldwin's stay amounted to nine plate appearances, over the span of just two weeks in the bigs. 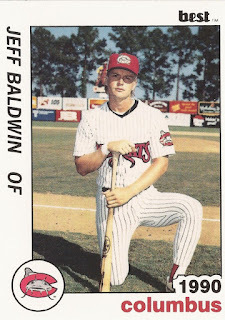 Baldwin's career began in 1985, taken by the Astros in the 14th round of the draft out of Camden County College. He started in the rookie Gulf Coast League, hitting .261 over 47 games. For 1986, he moved to single-A Asheville, hitting .272. In 1987, the year he spoke with The Sentinel, he hit .304 for Osceola. Baldwin first made AA Columbus in 1988, returning there full time for 1989. In 1989, he hit .273 over 96 games. He then started 1990 back at Columbus. By May, though, Baldwin made the jump all the way to Houston. The call-up came, Astros GM Bill Wood told The Houston Chronicle, after Baldwin made strides that year, improving his baserunning and fielding. "It's an improbable story, but stranger things have happened," Wood told The Chronicle. "He's made people discover Jeff Baldwin, and that's a good story regardless of what happens." What happened was Baldwin ended up getting into seven games, eight at bats. He scored a run, but didn't get a hit. Baldwin then returned to Columbus and, later, AAA Tucson. He played two more seasons in the minors, with the Cubs and Astros between AA and AAA. Baldwin, though, never returned to the majors.